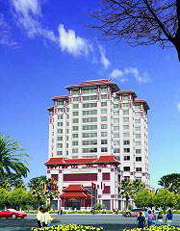 The Imperial is the first international five star hotel in Hue, possessing the strategic location, on the bank of perfume river and walking distance to tourist attractions. - Room view: Panoramic views to Hue city or impressive Ngu Binh mountain. - Room view:Panoramic views to the poetic Perfume River. - Room view: Panoramic views to the poetic Perfume River . - Configuration: King bed, one Living room, one Dining room, and two bed rooms. The business center provides ADSL, wireless internet access, telephone, fax, photocopying, translation, computer rental and secretariat services. With an exhibition of the delicately traditional embroideries of Vietnam, guests can choose excellent hand-made embroidered XQ pictures, embroidered fashion or various handicraft souvenirs. In Prince Club, players can look forward to an array of exciting slot games namely Jackpot Party’s multilevel progressive jackpot and Cron machines. The club also features the latest state of the art multi-terminal roulettes, blackjack and baccarat games which combine with our first class service; will ensure your visit to Prince Club to be a memorable and exciting experience. At the height of 16 meters, the pool offers an open grand view of the city below. Snack and beverage of all kinds are served poolside. The fitness center next door is fully furnished with up-to-date exercise equipments. Occupied the half of the top floor (16th floor), this unique luxurious bar offers spectacularly panoramic views over Hue city, beautiful Ngu Binh Mountains and romantic Perfume river. The King’s Panorama bar serves the collection of the finest drinks in a very cozy atmosphere to help tired businessmen guests unwind. This is exactly the most ideal venue where nobody should miss. The Yoshihara restaurant can be taken as a real small Japanese house. With food ingredients and seasonings imported from Japan, all dishes here are as authentic as they could be, meticulously prepared by Japanese-trained specialty chefs. Decorated as a Royal Dining Room, the Royal Dinning Room will surprise you with its authentic cuisines of Hue’s royalty. Just imagine that you are the King, beside you is the Queen accompanied by Mandarins, all wearing traditional royal clothes. All the food served is royal including dishes symbolizing the dragon, phoenix, or peacock…..All meticulously prepared to the finest details for a sumptuous dinner that fits for royalty. There are some important protocols to observe during this dinner. Before the first drink for the King health, there is a short speech made by servant chief. Everyone has to say "Van tue" (10 thousand year) to wish the King a long life. The best Hue Imperial court music and dance will be performed by artists from Hue conservatory. Nothing better than enjoying delicious banquet while listening to melodious music and having a feeling of being the King. That’s why Royal dinner is a must for those who come to Hue. The Imperial restaurant features an open-shown kitchen with spacious in-door and out-door areas. The Restaurant is set in an elegant décor and offers an elaborate and extensive international buffet featuring the best of the both western and the Asian world. For Vietnamese food, you could also enjoy specialties of three regions of Vietnam. Its three private rooms are exclusively reserved for close meetings or intimate conversations. The out door garden is a fascinating choice for those who love romantic and gentle atmosphere. Exquisitely designed, the Starlight Lounge is a luxurious venue for those who love the difference. This is the venue that serves the very exclusively high-class Lunch & Dinner style with outstanding service. This venue is also the site where you can admire the surprisingly beautiful Perfume river at the sunrise or at the sunset.